This Vintage rubber Eskimo emotion doll is one of my favorite pieces from my vintage rubber toy collection. It has a knob on top of its head and when you turn it, the doll changes moods! It's either smiling and happy, crying and sad, or grumpy and being a sourpuss baby. 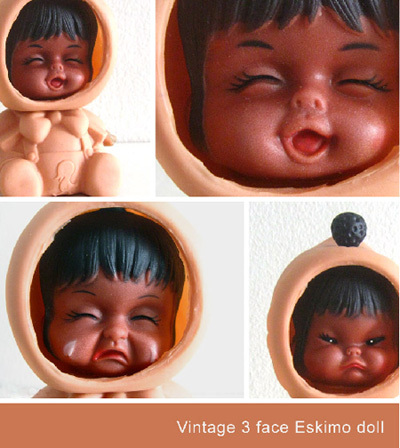 These type of 3 faced dolls were made in the early 1970s in both Hong Kong and Korea. And I have seen them with outfits in a few different colors. Usually i keep him displayed with a happy face, but its fun to change its expression. What is your favorite look of this cute toy? I have this little guy/girl...whichever it is lol. I like the pouty face. These are so cute. I have Native American ones. I didn't imagine they made them in a wide variety. These are exceptionally precious. wow, so cute! i hadn't seen a vintage toy that sophisticated before. Where is that 'like' button to hit on your posts? Thank you for commenting!